Riffle Pottery is a family owned business that specializes in handmade functional earthenware, stoneware and porcelain pottery. 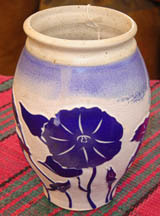 Traditional pottery designed with utility in mind. Pottery made to be touched, to be used, and to be appreciated for its utility as well as its beauty. Growing up in rural Webster County, I learned at an early age the value of anything handmade. The handmade items came with a connection and a relationship between the person who made them and me. The quilts my grandmothers quilted, their braided rugs, the toys, and Christmas ornaments that my grandfather made for us. These are the items that connect me with the past as well as with the present. The significance of my work is that each piece is handmade. The clay bodies I use are blended my me from clay mined in several states as well as other countries. The clay is then formed into its shape by hand using a traditional potter's wheel. 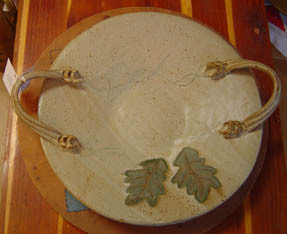 After completely drying, the pieces are fired to allow easier application of the glaze. The glaze is then applied by hand and allowed to dry before loading the pieces into the kiln. The pieces are then burned in the kiln to 2300 degrees, giving the pottery individual character as well as durability. Riffle Pottery is unique in the way we produce our pottery. We formulate, weigh and blend each batch of clay and glaze to be used for our pottery pieces, sometimes utilizing local material. "Wood Ash" is one of these materials; we collect the ashes from our woodstoves and add it as a flux material to the glazes. In turn the wood ash imparts a textural beauty as well as, visually appealing color variations. In 2000 we opened "Rimfire Gallery" which features locally made handcrafted items such as: candles, fine furniture, baskets, wooden spoons, woven rugs, and bath and body products. Riffle Pottery produces a wide range of products including candlesticks, cups, bowls, water pots, egg separators, and much more. We also make items to order. 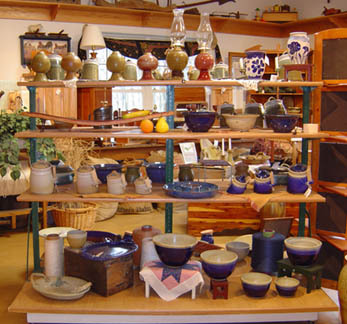 Riffle Pottery is located on State Route 82 just outside of Cowen. Take I-79 to Exit 57 (Summersville, Beckley) and follow Rt. 19 South for 10 1/2 miles to Birch River. Take the Webster Springs, Cowen exit and at the end of the ramp turn left onto Rt. 82 east. Follow Rt. 82 east for 16 miles. Turn right onto the gravel road at the Riffle Pottery sign, just before Big Ditch Lake. Follow driveway to the top of the hill.